The Newbury war memorial in Bartholomew Street holds the names of 339 WW1 casualties, but this does not reflect all the losses of young men from the town. In the case of the name W S Smith there were two local casualties of that name: Walter Sidney Smith from Speenhamland went down with HMS Good Hope in November 1914 and William Sidney Smith from West Fields died during the German Spring Offensive in 1918 . There is good reason to believe that it is William's name that is on the memorial. The names on the memorial are, in general, distributed randomly around the 13 bronze tablets mounted on the wall around the memorial cross, 12 of which hold the names. Exceptions to this random order include the cases of brothers, who are very often grouped together. W S Smith appears immediately above R Smith and B W Smith - William's brothers Richard and Benjamin Weller Smith. This grouping is one argument that William is the W S on the memorial, but, perhaps, a more powerful argument is that it is almost impossible to think of their parents putting forward only two of their sons for commemoration. So it is William’s story that his told here. For Walter’s story click here. William was born in 1887, the son of Sidney Smith and his wife Kate née Weller. 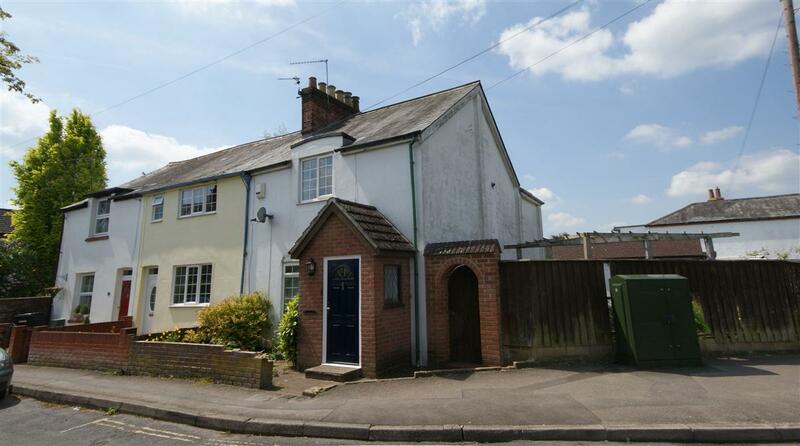 Sidney was a carpenter who rented a small terraced house in Blenheim Road from a man with three surnames – local accountant Benson Fletcher Freeman. The house was then known as 4 Church View Villas, it became 17 Blenheim Road when street numbering was introduced in the 1920s. It was at the northern end of a terrace of four small cottages and was demolished to allow for the road around the corner it occupied to be widened and a pavement put in. The remainder of the terrace (11, 13 & 15 Blenheim Road) is still standing. The family consisted of Sidney, Kate and their four children : Edith Rachel (born 1884), William Sidney (1887), Richard (1890) and Benjamin Weller (1892). After his schooling, which was probably in the local National School, William followed his father’s trade becoming a carpenter and joiner. His brother Richard, also a joiner, worked for Elliott’s, a large joinery business in Albert Road, Newbury; it is possible that Sidney and William also worked for the same company, which was a major employer in Newbury at that time. Nevertheless, when conscription was introduced in January 1916 it was not long before William got the call. As a carpenter his skills were much needed at the front, so he was posted to the Royal Engineers and, following a period of training, to the 227th Field Company. This was one of two Field Companies supporting the activities of the 39th Division, both were originally formed from volunteers from the Stockton on Tees area. Engineers in Field Companies were not backline troops, they would often be involved at the sharp end. On 23 March 1918 the Germans launched a huge offensive along the Somme, smashing through the British defences under the cover of fog they were soon crossing the Crozet Canal and the Somme. The 39th Division, as part of XIX Corps was caught up in this maelstrom; by the 28 March their position was untenable, no more than a line on a map. The French to their south were falling back, the Germans were behind them to the north; they had no choice but to fall back again. The 39th Division (by this time much depleted) was selected to be the rearguard. Any man who could hold a rifle was expected to fight, though the Engineers may well have been busy preparing to demolish bridges, railways or anything else that might be of use to the enemy – the very structures that they had been busy building since the area was occupied during the fighting in 1916 and the subsequent German withdrawal to the Hindenburg line. 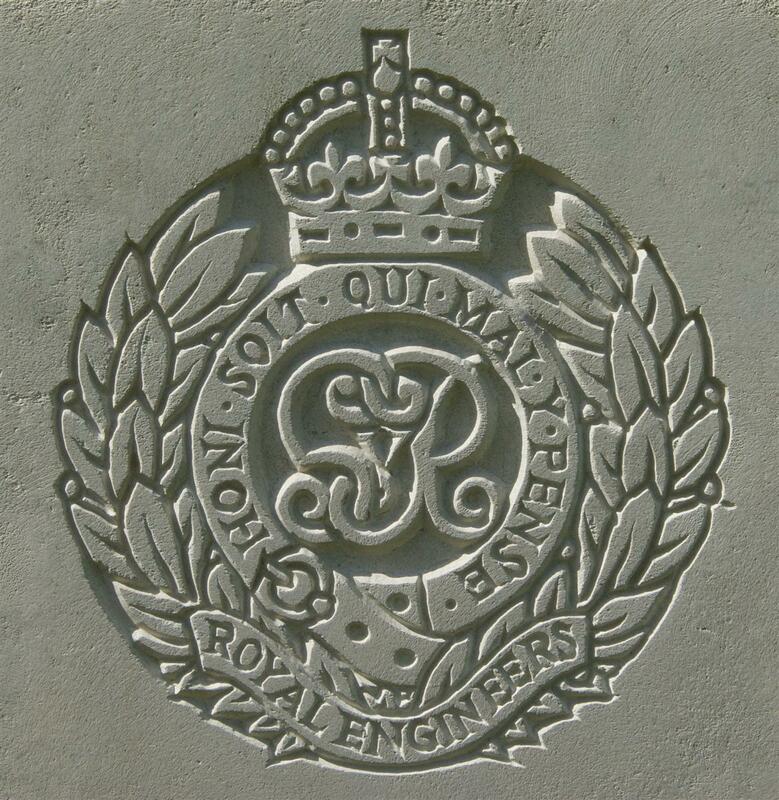 The regimental badge of the Royal Engineers, as used on CWGC headstones. The Germans kept coming; though the 39th Division made a counterattack using the 116th and 118th Brigades, which, by this time, were no more than a pair of weak battalions (ie about 20% of their strength 5 days earlier). The following day what remained of the 39th Division was withdrawn into reserve – after 6 days of fighting the British had lost more than 250,000 men. The proportion of these who died (over 15,000) was lower than in other WW1 battles, but huge numbers were taken prisoner. SMITH – Mr and Mrs Smith, of 4, Church-view, West Fields, Newbury, have been informed that their son, Sapper W S Smith, 498,433, 227th Field Company, RE, 3rd Section, has been missing since the 28th of March. Any information regarding him will be gratefully received by his parents and family. However, the news that followed was that William had died in those desperate days, when the Allies came far too close to losing the war. 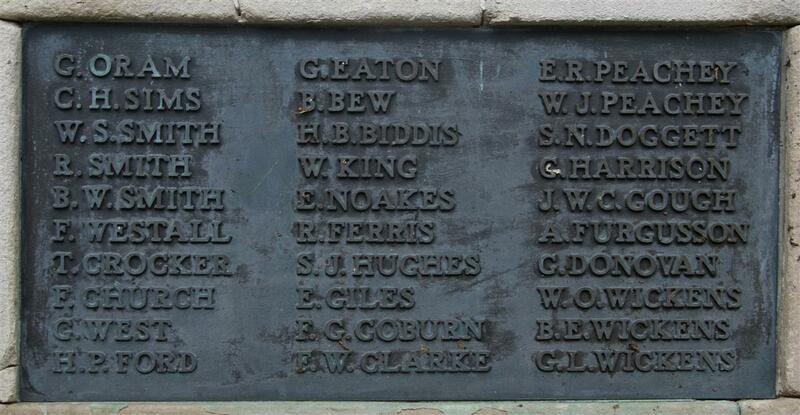 William's name on Newbury War Memorial, above those of his brothers. Sidney had Kate had lost their last son; William’s body was never identified, his name is remembered on the Pozieres Memorial. Locally he is remembered on Tablet 11 of the Newbury Town War Memorial and the parish memorial board and roll of honour in St Nicolas Church, Newbury. William’s brothers had died the previous year, Richard in action with the 106th Company, Royal Engineers and Benjamin struck by lightning while working with a Labour Corps detail.